Collagen Cross-Linking (C3R) is a treatment that brings new hope for keratoconus patients by strengthening the front layers of the cornea using riboflavin (vitamin B2) and ultraviolet light (365 nm). This procedure creates new bonds between the corneal fibres and thus strengthens the cornea. C3R is proven to slow or stop progressive keratoconus and is also effective in treating corneal ectasia in post LASIK and PRK patients. Since it began in 2003, thousands of patients around the world have been successfully treated. In recent years corneal cross-linking became the standard procedure for treating patients with progressive keratoconus because of its effectiveness and lack of serious side effects. In a number of clinical studies, it was demonstrated that in more than 85% of eyes treated the BCVA increased significantly. Six months after the procedure cylinder was reduced in the majority of all patients. The steepest K-value was reduced by an average of 1 dioptre. Shorter treatment time, significantly reduces the exposure time to UV light from 30 minutes to 5 minutes. Simple, reliable and safe in-office procedure that can prevent the necessity for a corneal transplant. 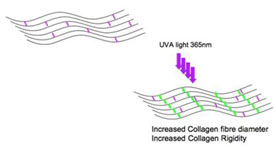 Molecular crosslinking of corneal collagen fibres by combined riboflavin/UVA illumination. 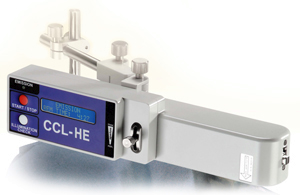 Increases the biomechanical rigidity of corneal tissues. A clinical history since 1999, proven to be a reliable method for treating Keratoconus and Iatrogenic corneal ectasia. No injections, incisions or stitches. Before treatment begins, numbing drops are applied to the eye to ensure patient comfort. In some cases, the corneal epithelium is then removed. The treatment begins with the saturation of the corneal surface with riboflavin eye drops for about 30 minutes. Next, Dr. Sathish illuminates the eye with ultraviolet (UV) light for 5 minutes. The time of treatment may vary from patient to patient. Riboflavin (vitamin B2) drops are installed to the cornea before and during the cross linking procedure. Ultraviolet light at 365 nm is used to activate the riboflavin within the cornea to induce cross-linking. Have been diagnosed with progressive keratoconus or have had previous LASIK or PRK surgery and be currently diagnosed with corneal ectasia. Possess corneal thickness greater than 400 microns at the thinnest point. The corneal collagen cross-linking treatment uses a photo-sensitizing agent called riboflavin (Vitamin B2) and ultraviolet light (365 nm) to to strengthen chemical bonds in the cornea and develop new cross-linking. among the collagen fibres within the cornea. With each additional new crosslink, the cornea becomes stronger. This helps slow and stop the progression of keratoconus or corneal ectasia. Cross-linking of collagen refers to the ability of collagen fibrils to form strong chemical bonds with adjacent fibrils. In the cornea, collagen cross-linking occurs naturally with aging due to an oxidative deamination reaction that takes place within the end chains of the collagen. It has been hypothesized that this natural cross-linkage of collagen explains why keratectasia (corneal ectasia) often progresses most rapidly in adolescence or early adulthood but tends to stabilize in patients after middle-age. In addition to the cross-linking that occurs commonly with corneal maturation, there are several other pathways that can lead to cross-linkage. Glycation refers to a reaction seen predominantly in diabetics that can lead to the formation of additional bonds between collagen. In the pathway most relevant to this topic, oxidation has been shown to be able to trigger corneal cross-linkage. through the release of oxygen free radicals. The basis for the currently employed corneal collagen cross-linking techniques were developed in Europe by researchers at the University of Dresden in the late 1990's. UV light was used to induce collagen cross-linking in riboflavin soaked porcine and rabbit corneas via the oxidation pathway. The resultant corneas were shown to be stiffer and more resistant to enzymatic digestion. Investigation also proved that the treated corneas contained higher molecular weight polymers of collagen due to fibril cross-linking. Safety studies showed that the endothelium was not damaged by the treatment if proper UV irradiance was maintained and if the corneal thickness exceeded 400 microns. For further information, download: Corneal Collagen Cross-Linking PDF. Please call our office at 01292 282100 with any questions or to arrange an evaluation for treatment.